Ebenezer Scrooge suddenly woke up from his armchair as the sunlight beamed through the windows into his drawing room, filling it with light. Was it all a dream? It was all too real for Scrooge to simply forget. And indeed, he had hardly forgotten his poor nephew upstairs! 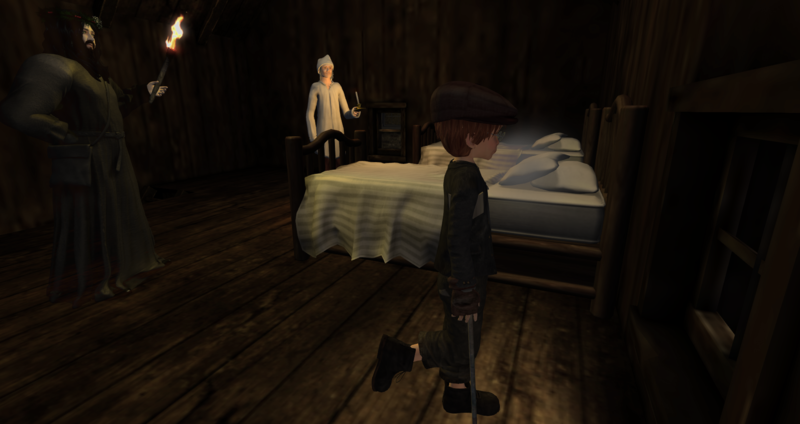 Scrambling out of his chair and up the stairs, Scrooge burst into his sick nephew's bedroom only to find the bed completely empty. I am sorry to admit that I faked my illness. None of it was true. I did not want to say goodbye, and I wanted to know everything would be in good hands before I left. I have gone off with the RMS River Thames as her new chief Steward. I've missed the sea so much, and I've heard her calling me. By the time you read this letter, I'll be off on my first voyage to America on my new vessel of employment. Do not worry about me, I've been on ships since I was a young lad, 12, if I remember right. The pub is yours. Take good care of those Londoners, I know you will. 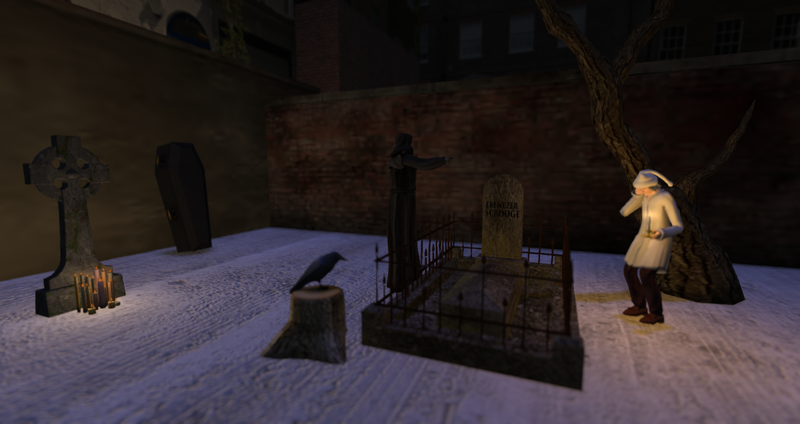 Scrooge was angry at first, but quickly remembered the night before, seeing the deathly spirit of Robert Marley, poor Tiny Skyler, and the site of his own grave. This would be his chance, he had to start anew, even at his old age. And with that, he was off! But he had forgotten what day it was! Running out into the street wearing nothing more than his nightshirt, he called a cab and headed directly for the White Hart in Richardstower. On arrival, he ran upstairs to Tiny Skyler who smiled at Scrooge and offered him a Happy Christmas. "Christmas..." he remembered. "Then, we shall have a big party!" Scrooge exclaimed. 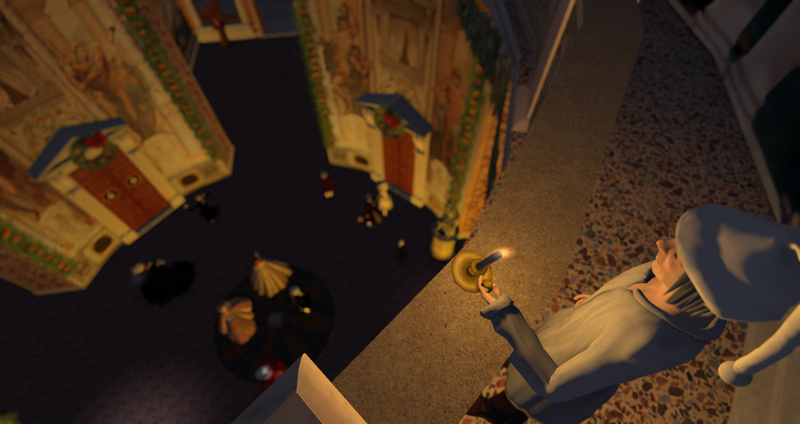 And indeed, on that night, all of Richardstower gathered for a Christmas celebration under the stars. Under the stars, everyone sang, danced, and smiled. As an old man learned how to smile yet again, his nephew returned to the seas again, and meanwhile, an entire community returned to its joyful spirit as 1880 came to a close. 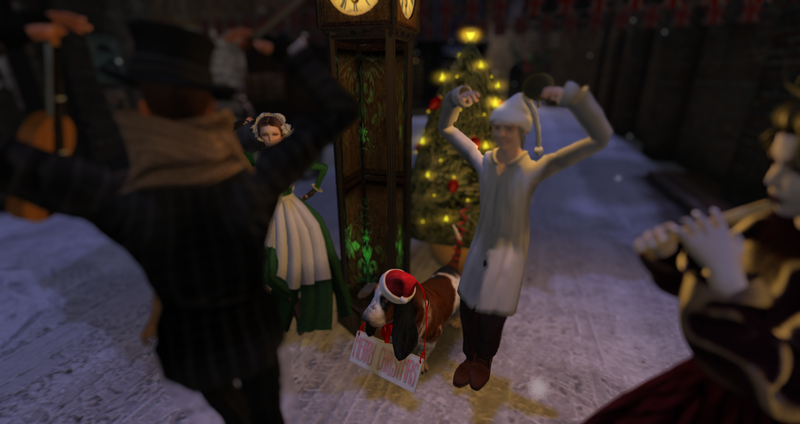 Happy Christmas from the 1880s Community! p.s. As Hyacinth Lowe moves on to the seas, we move on as well, as a project. 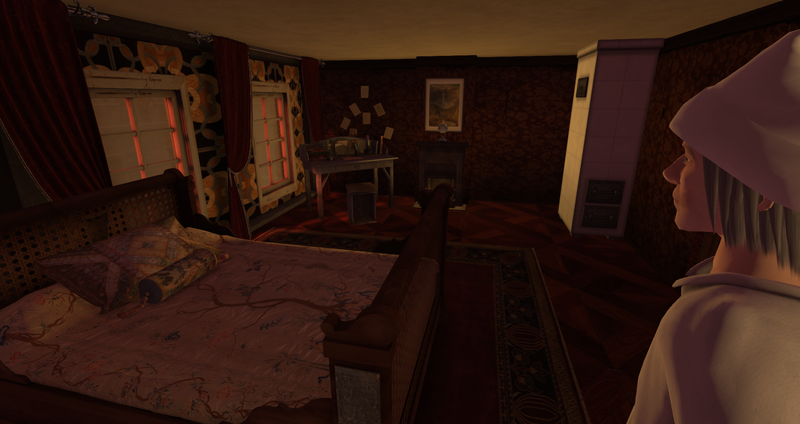 With the approaching New Year, we plan to bring you 1881, and an entirely new and revamped sim taking place in a different part of England. Stay tuned for more announcements! A great big jolly spirit entered the through door into Scrooge's drawing room. With dried tears still left on his cheeks, Scrooge looked up to see a face that was...almost recognisable. 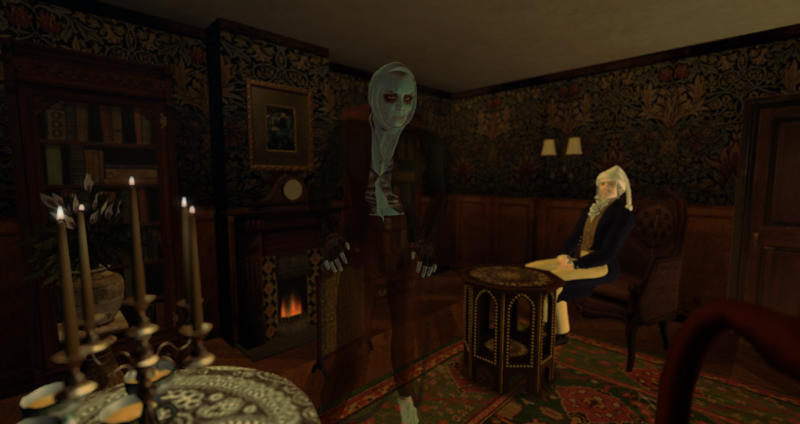 Calling himself the Ghost of Christmas 1880, he whisked Scrooge to the White Hart Inn, showing him poor Tiny Skyler, who shivers every night in the cold, with no parents, no food, no friends, and a cold bed to sleep in. How could Scrooge sit content by his fire while a poor child suffered such a fate on Christmas Eve? Even such a jolly spirit as the one enlightening Scrooge with such a vision could not see any good in that! Scrooge would now be left alone to ponder this sad thought back in his drawing room as he awaited the arrival of the third spirit. The fireplace and the candles suddenly went out. Only Scrooge's personal candle remained lit. A violent wind burst in, and, as Scrooge covered his eyes from the current, a shadow loomed over him. It was the final spirit, the Ghost of Christmas Yet to Come. In the strong gust, it would whisk away old Ebenezer to a morbid site; an empty cemetery. And there, lying beside all that morbidity was Scrooge's own grave. Ebenezer burst into tears as the languid and skeletal hand of the ghost pointed at the headstone. A raven looked on and called out the the old man's demise in the silence of the night. Scrooge thought he could escape his past, but his past found him when he least expected it to. 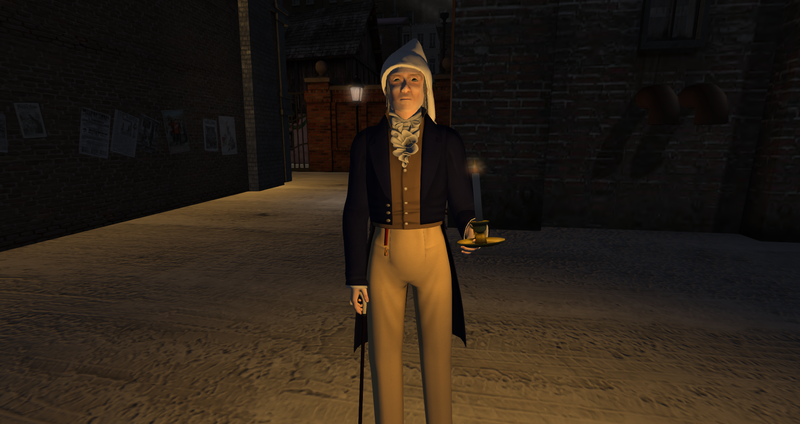 As his nephew, Hyacinth Lowe, languished of fever in his bed upstairs, Scrooge decided to sit by the fire and take tea. But alas, the flames of the fire whipped forth and out emerged a figure from Ebenezer Scrooge's past. "SCROOGE! "the figure ghoulishly exclaimed. "I am your old associate, Robert Marley! "the ghostshouted. "Remember when I played in an orchestra and toured Italy? You were with me then, Scrooge! ",he continued. "Yes, but that was long ago and you are now dead..."Scrooge answered; recognizing his old friend but holding his composure on the surface. "I am but a shadow of what I once was, Scrooge, and now I carry the very instruments I once played on chains! Each of them are filled with heavy coins; the bitter consequence of that money lending business we started together. "Marley replied, as he showed Scrooge what had become of him. "This will be your fate too, Scrooge, if you do not change your ways! You will be haunted by three spirits! Wait for the clock to strike the first hour, and the first spirit will appear! This is no trickery, Scrooge!" With these words, Marley vanished once again into the flames. Scrooge remained stunned in his chair as the night dragged on, only emerging once to change into his nightshirt. As the clock above the mantle chimed 1 o'clock, the first spirit appeared. Glowing, and hard to visualise, she called out Scrooge's name and called him towards the door. Ebenezer stood up and walked slowly across the room, as if in a trance. As he opened the door, he was embraced by the sound of sweet music. He went through the portal only to find himself in the actual location of one of his youthful performances. "Ah, Rocca Sorrentina." he said. "I know this place, I performed here many years ago with Marley." Scrooge has been doing his best to terrorise the people of Richardstower since his arrival in the district a few days ago. 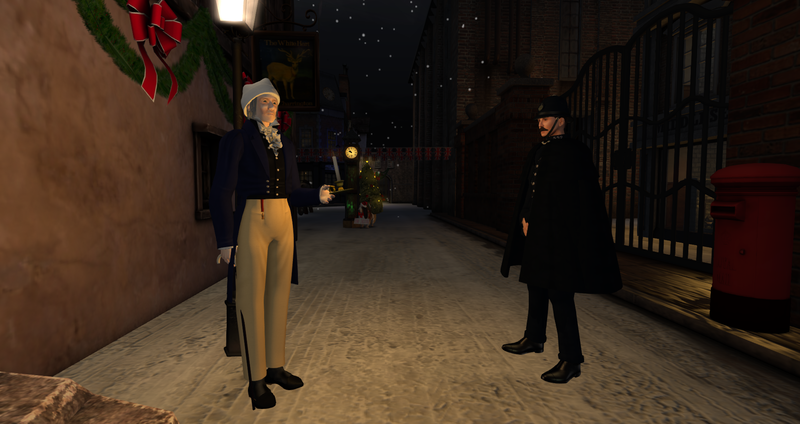 After questioning young Mirka and berating her for singing carols in the street, Scrooge went as far as reporting her to Constable Helendale. To say he is not a very nice man would be to understate the truth. He has already doubled the prices of local pints, scolded every local child he has seen, and tried to have the police raid the opium den by the harbour. Most importantly. he has forgotten to look after the poor urchins living above the pub. What will become of them in the cold winter without the food and drink provided to them free of charge by Mr. Lowe?